From Free Though Magazine, Chicago - 1898: Among the intelligent and promising young men who are engaged in the good work of expounding and advancing Liberal thought is Pearl W. Geer, of Silverton, Ore., whose lectures and writings have made his name quite well known to Freethinkers, especially on the Pacific coast, to which his labors have been chiefly confined. 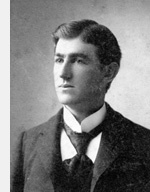 Mr. Geer was born near Salem, Ore., June 29, 1873. He remained with his father on the farm until he was sixteen, when, his father removing to eastern Oregon and starting a store, the young man accompanied him and served as clerk for two years. He then accepted a position as clerk for a mercantile firm at Silverton. Mr. Geer belonged to a family of Freethinkers and he early became interested in Free Thought. He read the Boston Investigator at an early age, and he says never knew by experience the terrors of superstition. The first book he ever read was David Copperfield. Later he became interested in works on philosophy and religion, especially in the writings of Herbert Spencer, of whom he is a great admirer. In 1894 he formed the acquaintance of Katie Kelm Smith, and assisted in forming at Silverton a secular Sunday-school, which he helped to conduct while he remained in that place. He prepared a lecture entitled "Why I am a Secularist," which he delivered at Silverton in June, 1895. It was well received. The December following he entered a medical college in Portland, and while in that city gave three lectures before the Portland Secular Church. He then formed the acquaintance of Prof. J.E. Hosmer and his wife, who were in charge of this church. After passing the first year examination at the end of the term in the medical college, so interested was he in the Liberal movement that he determined to give up everything else for that work. He devoted one summer to lecturing throughout the State. His observations and experience convinced him that what the Liberal cause needed was steady, concentrated educational work. After conferring with Miss Olds and Professor and Mrs. Hosmer, he returned to Silverton, and, with the other parties named, proceeded to carry out the plans which had been projected. A printing outfit was purchased, a paper started, a school formed, and the educational foundations of a university established. Mr. Geer writes, under date of January 23, 1898: "So far we have made a financial success of our enterprise and will erect a university building this year. The people of this town are deeply interested. We are living here on the co-operative plan. We are doing our own work for a living and expect to be further compensated by making the cause a success." At its last convention Mr. Geer was elected president of the Oregon State Secular Union, his intelligence, his unblemished character and the practical work he had done being his high recommendations for that honorable and responsible position. From The Salem Statesman, 1934: Pearl W. Geer, native of Marion county's Waldo Hills, didn't know when he used to imitate the chirp of crickets, the yipping of coyotes and the plaintive bleat of a calf for its mama that he was developing a talent that would some day take him to Broadway as one of the nation's eminent character actors. If you don't recognize the name, his stage name is Willard Cary, which is a combination of family names. Mr. Geer, or Mr. Cary if you prefer, is in Salem now, the first time in 24 years. Acting came to him a little belatedly, and along the way he did other things, among them newspaper reporting, and it was he who made Dr. Frederick A. Cook admit that he didn't discover the North Pole. Geer is here from his home in Boston, and also here is his sister, Mrs. Ida Clymer of Yuma, Ariz. They came for a Geer family reunion to be held next Sunday. Both are guests at the home of their nephew, Waldo Geer, 1395 North Cottage Street. Geer's imitations of bird, animal and insect voices had been heard along the Atlantic seaboard in his prestage days. "I got on the stage in 1928," he relates. "The producers of 'Our Town' wanted someone who could do buccolic sounds, and some way they heard of me. I was with that play throughout its long Broadway run and then with the troupe of England." It was a real theatrical triumph when Mr. Geer, or Mr. Cary chirped like a cricket the stage. So much so that New York newspaper gave it a two-column story. It came about this way: Jed Harris, the producer, wanted someone who could crow like a rooster and do a horse's whinny. Mr. Geer suggested a cricket chirp, and did one. "It's a symphony in itself," declared; Harris. But once on the stage Mr, Geer discovered, and so did the that he had other theatrical talent than just chirping, twittering or bellowing like a range bull. And so a character actor came before the footlights. He had the part of Henry Ford in "White Wings," by Philip Barrie, parts in "The Barretts of Wimpole Street," and in "Dough Girls," all on Broadway. And there were other plays. In "Arsenic and Old Lace" he played two parts, using two stage names, and the critics praised both, not knowing they were the same man. "I figured if I could fool the critics I wasn't doing so badly," he says. He impersonated George Bernard Shaw in Shaw's play "Too True to Be Good," and was considered a perfect type in an Abraham Lincoln impersonation. Other appearances were made in summer theaters. "I lived on the Waldo Hills farm," says Mr. Geer, "until I was 16, and I also worked in a cheese factory. The farm was sold and I went to Burns in the Harney Valley where my father, Cal Geer, had a hardware store. In the Harney country I had lots of time and opportunity to imitate the animals and birds of the range country. "Later I returned to Silverton, worked for the Adolf Wolf store and married the boss' daughter, Sophia Wolf. Then I started out to study medicine along with my brother-in-law, Louis Wolf. I didn't stay with it, but Louis did. When Admiral Robert E. Peary organized his North Pole expedition in 1905 a ship's doctor was needed. I got Louis a job, "In 1904 I had joined up with my cousin, Homer Davenport. He, as everyone knows, was a cartoonist, and I was a reporter. My big triumph was as a reporter for the New York Evening Mail. I got an admission from Frederick A. Cook that he had not discovered the North Pole. I remained with Homer until he died in 1912. I managed his lecture tours, managed his farm and assisted him in the importation of the Arabian horses that he exhibited at the Lewis and Clark fair in Portland in 1905." Mr. Geer's father, Calvin, or Cal Geer, was a cousin of T.T. Geer, Oregon governor and United States senator, and a brother of Bye Geer, second Oregon land agent. They were sons of Ralph Cary Geer, first Oregon nurseryman, who, contrary to the opinion of nearly everyone else, demonstrated that fruits and vegetables that later became standard crops could be grown in Oregon.